A moist but heartfelt Merry Christmas! So much for a white Christmas this year: it's been raining off and on for about a week, and the temperatures are in the high 30s to 40s. All in all, pretty typical for our zone 8b location. 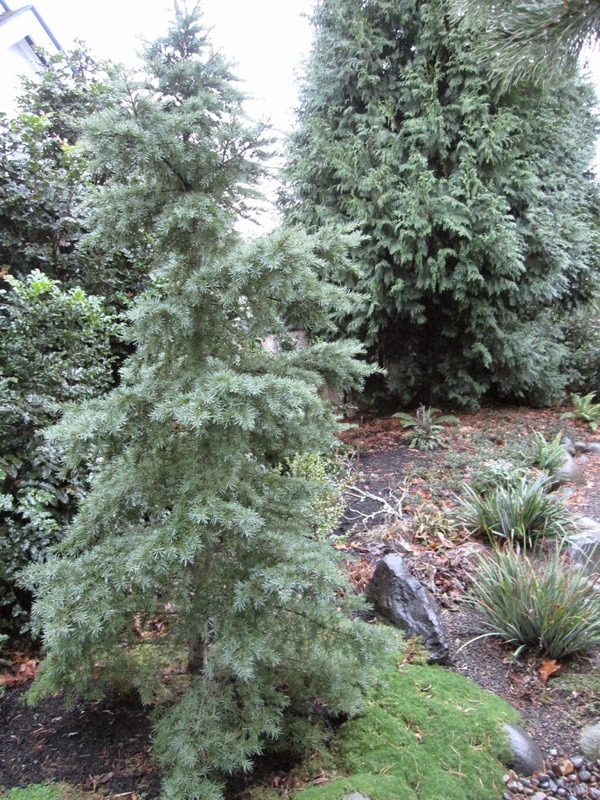 Our real Christmas tree (we have an aluminum one indoors) the Mountain Hemlock (Tsuga mertensiana), remains sturdily erect against the deluge. 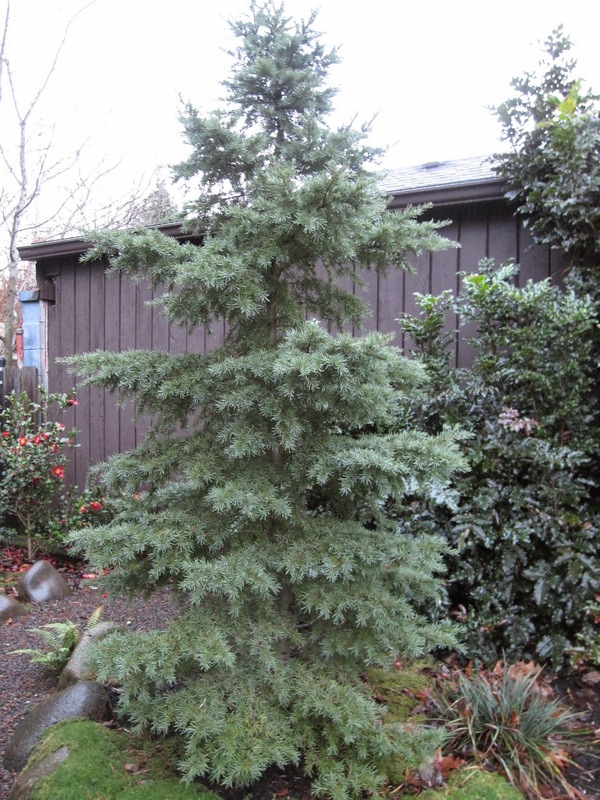 It really is a lovely little tree - slow growing, and somewhat fuller and fluffier than its higher altitude brethren. This year, I decided against adding the usual silver and red decorations to it, because Camellia sasanqua 'Yuletide' was putting on such a show behind it. Mother Nature does a pretty nice job of looking good all by herself. I wish you all a very Merry Christmas - and the best of whatever celebration is dear to your heart! Like the days as we draw near to the Solstice, this Bloom Day post will be short - there are very few flowers in my garden this month, and just a few indoor blooms. 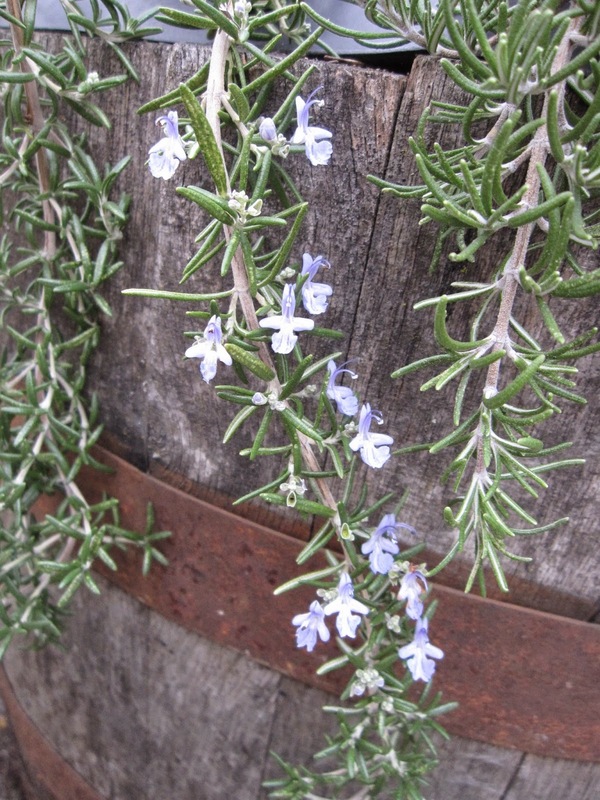 Flowers in the garden include a blooming stem of prostrate Rosemary that stands out on the otherwise green plant. Camellia sasanqua 'Yuletide' carries the month! 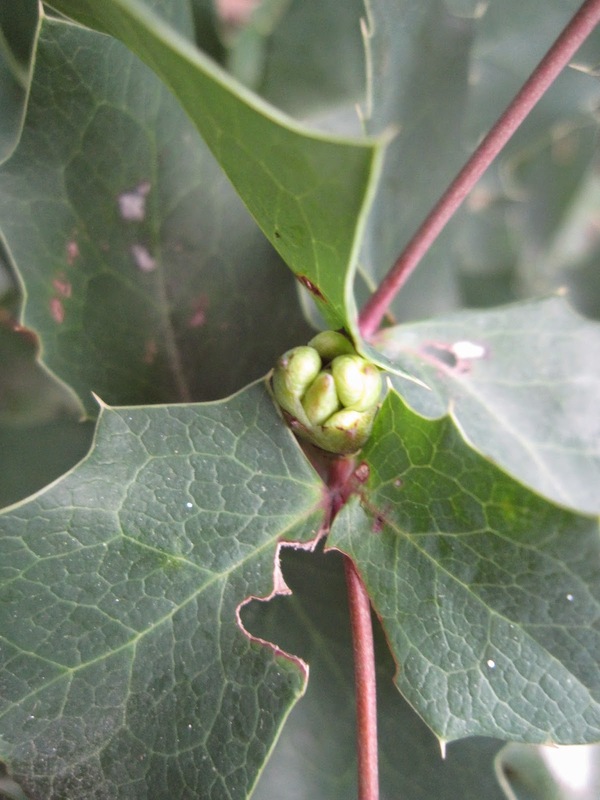 Mahonia nervosa repens is getting ready to bloom - will it be open for January's Bloom Day? Arctostaphylos 'Austin Griffiths' is also moving toward its bloom phase, but not yet opening. Indoors, Cyperus involucrata 'Baby Tut' appears to be thriving, if its fluffy, pollen-filled blooms are any indication. Maybe they're the reason I've been sneezing all day. I know most people up here grow Papyrus as an annual, but I just couldn't let it this happy plant die outdoors over winter. A NOID Streptocarpus (Streptocarpella saxorum, thank you, Rickii) is a reliable bloomer, often for months at a time. 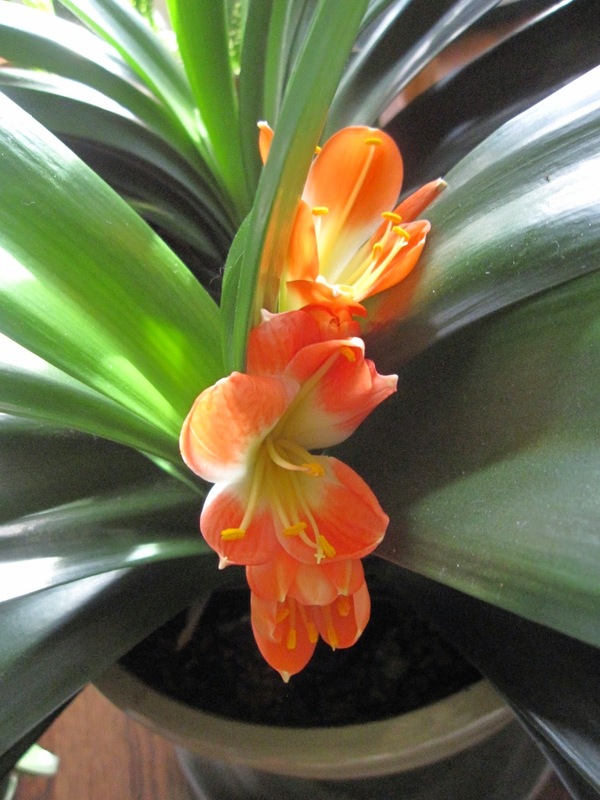 Last, Clivia miniata 'Belgian Hybrid Orange' steals the show indoors. Despite the paucity of December flowers in my garden, I am ever grateful to Carol of May Dreams Gardens for hosting Bloom Day each month. Click over there to enjoy many more flowers from all over the world.